Plans have been submitted to turn a vacant Hove nursing home for 15 people into four flats. The nursing home, Brittany Lodge, in Brittany Road, Hove, closed in February last year and was put up for sale. 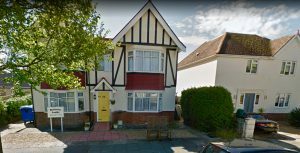 But the owner, Ravi Sumoreeah, of Grangeways, Patcham, has been unable to find a buyer and instead wants to convert the 13-bedroom property. The plans submitted to Brighton and Hove City Council propose two three-bedroom flats on the ground floor and two two-bedroom flats on the first floor. They also include a single-storey rear extension, demolition of a garage and comprehensive remodelling of the site. According to a planning statement prepared by chartered town planner Allison Keech and submitted with the application: “The existing building is a vacated nursing home. It provided 13 bedrooms, accommodating 15 residents with a lounge, on-site kitchen and office space. “It is assumed that it was originally built as a single family dwelling and is one of a handful of detached buildings along Brittany Road. “It is an impressive double-fronted property with side access/driveway to a garage and covered area. “The scheme will create two self-contained flats with three bedrooms on the ground floor. “The scheme will also create two self-contained two bedroom flats on the first floor. “The existing garage is to be removed and parking provided along the side of the building for 3 cars off road. The council’s planning policies say that planning permission will not normally be granted for proposals involving the loss of residential care and / or nursing homes which comply with, or are realistically capable of reaching, the respective standards set out for residential care or nursing homes. The planning statement said: “The decision to cease trading as a care home at Brittany Lodge was made in November 2017 with the final day of operation being the (Tuesday) 13 February 2018. “In a letter to the families and those involved in the business, the owner explained that it had become impossible to deliver high-quality care provision against the financial and bureaucratic burden now imposed on care homes. “As a small family-run business of 20 years, the owner felt that the scale of the business meant it was no longer fit for purpose due to the building type and size. “Further administrative pressures required to run the business meant that extra staff were needed but, due to a lack of space, this could not be supported. “The property was vacated in early 2018 and put up for sale. Considering the issues raised in the previous owner’s letter and the standard of accommodation and facilities now evident within the building, it is clear it was no longer capable of providing a care home service of high quality without substantial and significant redevelopment and overhaul. “The internal layout needs updating and there is be no guarantee it would be a profitable business capable of withstanding the financial and bureaucratic burdens experienced by the previous operator and business owner. “The economies of scale of such a small operation meant that there was no means to generate the level of income needed to address all the requirements and run a profitable business. “The applicant owns and manages a number of existing care homes within the city. The home was rated good by the Care Quality Commission (CQC) when it was last inspected three years ago. Neighbours have a few weeks to comment on the planning application which the council expects to decide by the end of May. The owner of the house next door – immediately to the north of Brittany Lodge – has also submitted a planning application – to build a single-storey ground-floor extension at the back and a loft, dormers and roof lights.